It just didn’t seem right to write a blog post about The Louvre without mentioning the Mona Lisa, so I decided that this painting needed its very own post. We arrived at The Louvre just after it opened and made a beeline to the Mona Lisa. The museum gets more crowded throughout the day, and the Mona Lisa is the main-attraction, so we wanted to go ahead and get that out of the way. Given how crowded the Mona Lisa Room was when we arrived, I’m glad that we didn’t wait until later in the day to see it. Leonardo da Vinci painted the Mona Lisa between 1503 and 1506 (while living in Florence), though several people believe that he continued working on it as late as 1517 (while he lived in Ambois). The Mona Lisa is an oil painting on a white, Lombardy poplar panel. 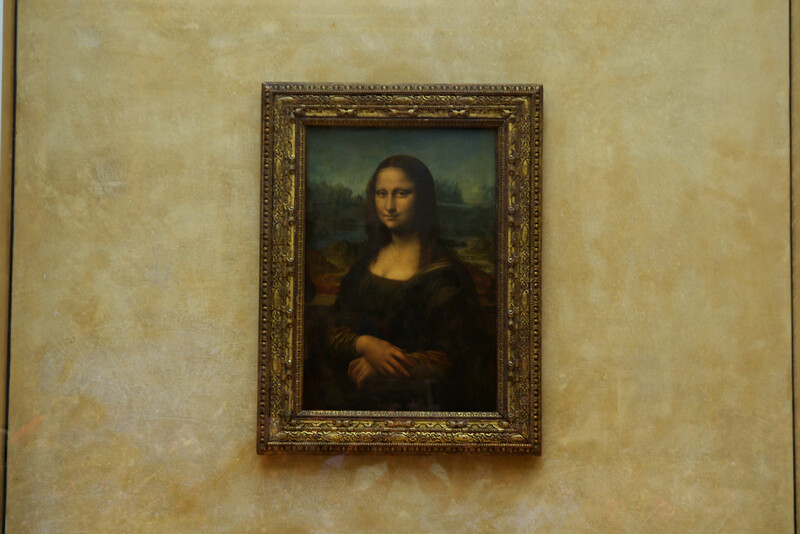 Though much mystery used to surround the painting, it seems to be fairly well accepted that the Mona Lisa is a portrait of Lisa del Giocondo, a member of the Florence & Tuscany-based Gherardini family. Her husband was Francesco del Giocondo, a Florentine silk merchant. The Mona Lisa is currently valued at $782 million USD. Seeing the Mona Lisa without a huge crowd present just wasn’t a possibility, so I decided to embrace the craziness and tried to take pictures that captured the experience of seeing the Mona Lisa along with hundreds of other tourists. When you enter the Mona Lisa Room, this is what you see. There are several other paintings in the room, but we didn’t take time to see them because there were too many people in this room for our liking. 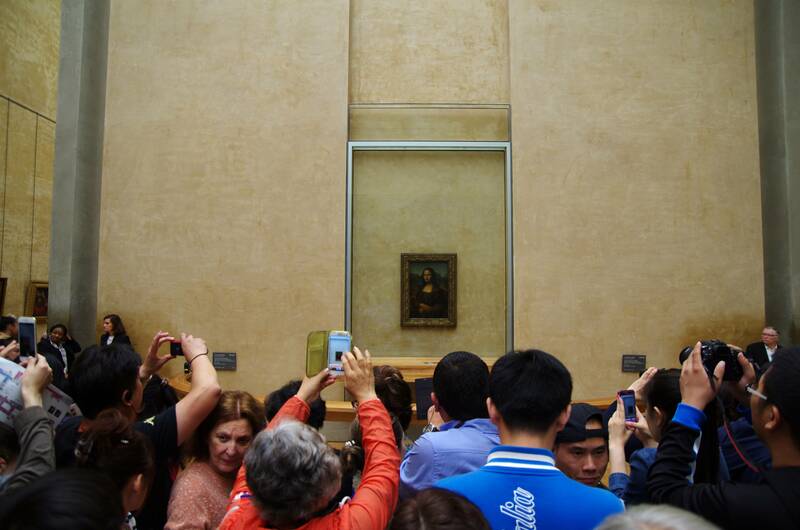 After you wade through some of the people, you’re able to get a glimpse of the Mona Lisa. 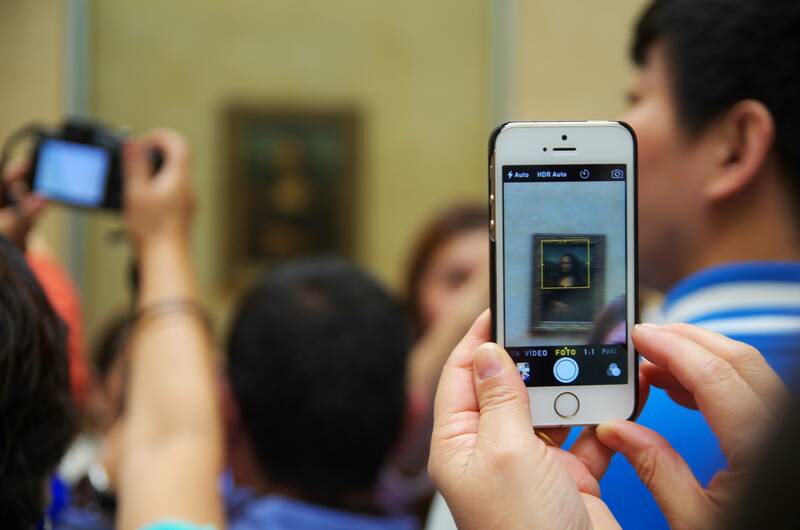 I thought that this photograph of someone taking a picture of the Mona Lisa with an iPhone would be a fun picture to look back on in 30 – 50 years (will iPhones still be around then?)! A few people, like me, still use stand-alone cameras to take pictures. 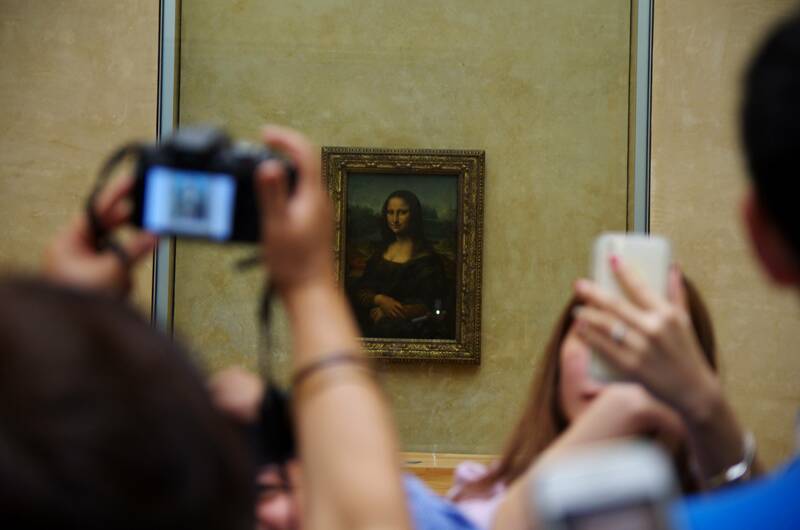 Notice the lady on the right-side of the photo taking a selfie with the Mona Lisa. I’m always amazed at the amount of people taking selfies with artwork. To each, his (or her) own. I tried to be polite and spent several minutes waiting for a clear path to the front of the group of people staring at the Mona Lisa, but it became evident that manners weren’t going to get me very far. Sooooo…I gave up and started acting like everyone else and pushed my way to the front so that I could get an unobstructed photograph. They don’t let you anywhere close to the painting, so this was the best I could get. 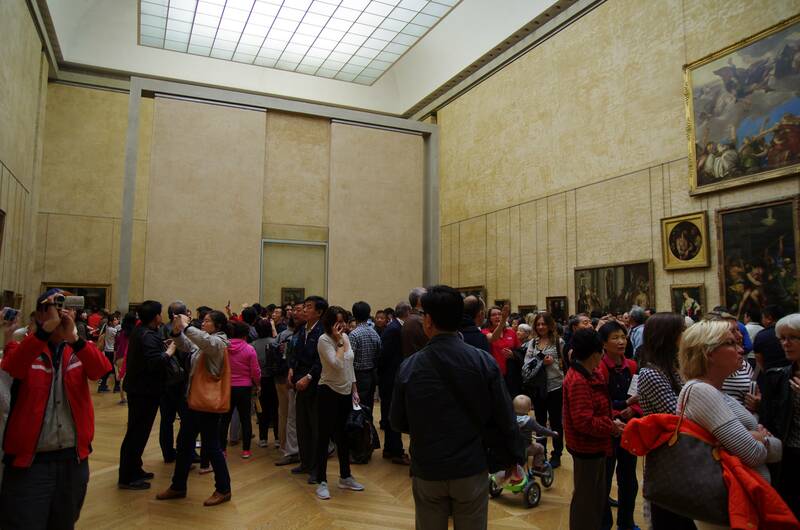 After I managed to get out-of and away-from the crowd, I snapped this photo of people viewing the Mona Lisa. Not exactly the calm, serene, life-altering experience one would hope for while viewing the most popular painting in the world. The painting across from the Mona Lisa is The Wedding at Cana (1563) by Paolo Veronese. 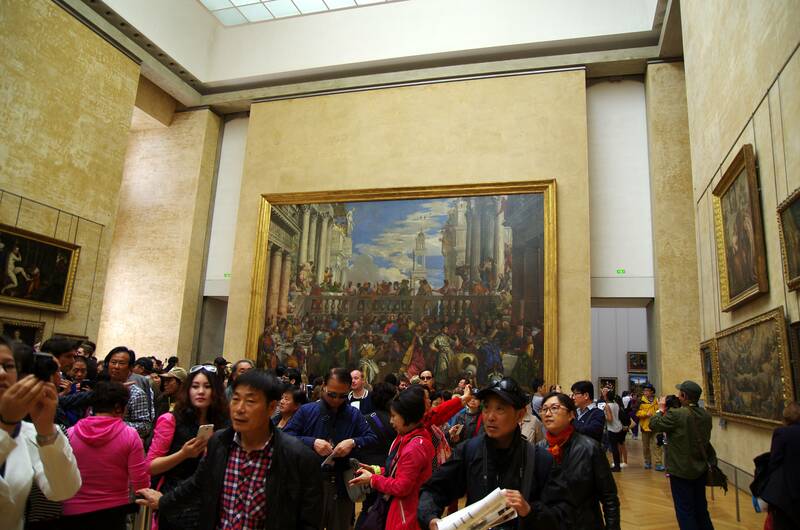 It is the biggest painting in The Louvre. This painting depicts the New Testament wedding during which Jesus performed His first miracle by turning water to wine. The painting hung in the refectory of a Benedictine monastery in Venice for 253 years at which point it was stolen by Napoleon (in 1797) and shipped to Paris. The painting measures 21.8 ft by 32.5 ft. I took one last shot of the crowd and the Mona Lisa before we (gladly) vacated the Mona Lisa Room. Great article. 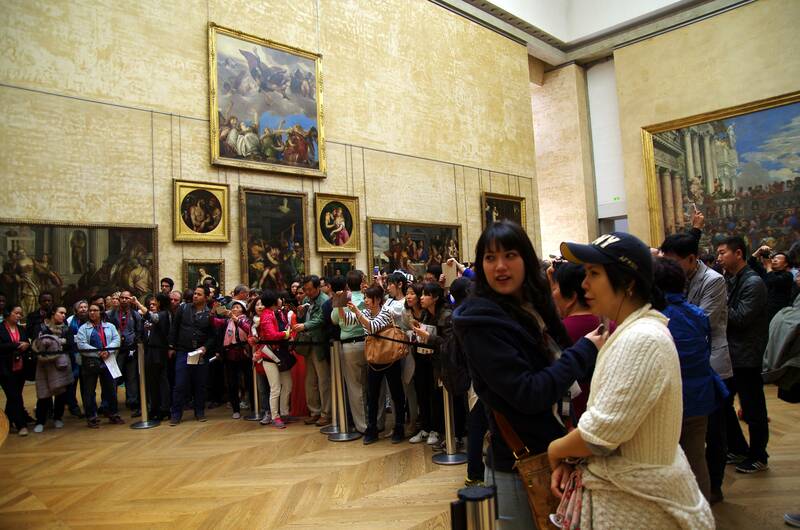 I found it so disheartening when we were in Louvre looking at the Mona Lisa, although I don’t think it was as packed. Through all the crowd and hassle I couldn’t enjoy the work as much as I’d like. The magic of the work was somehow obscured by its popularity and the fact you cannot get close to the work, which looked smaller than I expected didn’t leave me with enjoyment but disappointment. I love Louvre though and Leonardo, I had a much better experience seeing his drawings in the British Museum. Thank you! Sounds like I’ll have to put the British Museum on my list of places to see. We spent some time in Amboise during our trip to France, but we never made time to see Château du Clos Lucé, a decision I most certainly regret.